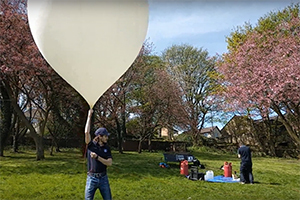 SELA and Sent Into Space, a company run by two Sheffield PhD graduates, have partnered in a bid to inspire young people into engineering by sending schoolchildren’s cards to the edge of space. At the ‘Think Inside the Box’ event in April, held at the Magna Science Centre in Rotherham, over 2,000 young people from across the South Yorkshire region were able to engage and learn about nine different engineering disciplines through SELA’s interactive exhibits. Exhibits included a virtual reality flight through the solar system, a lesson in engineering earthquake resistant buildings and the chance to have a go at keyhole surgery. The young attendees also got to meet Wobbly, a self-balancing robot, and raced against the clock to wire up a control panel to launch a space rocket. 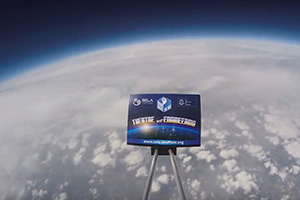 School students were told that if they collected stamps from each of the nine exhibitions, their completed cards would be launched into space with the help of Sent into Space, a start-up run by two PhD graduates from the University of Sheffield’s Department of Mechanical Engineering, Chris Rose and Alex Baker. After being launched into the stratosphere in May, the stamped cards are now back on planet earth and the schoolchildren will today receive certificates confirming that their card has been into space, and see footage from the launch. The collaborators behind this activity hope these experiences will resonate with these schoolchildren for years to come and hopefully inspire many of them to pursue an education and career in engineering, an area where there is currently a shortfall. Watch the launch and see the the cards in space!